+-How do I sign up for WashBox24? You can sign up and pay for selected package online at our website (www.washbox24.com) or simply download our Box24 mobile app (http://goo.gl/zEqt8t iOS, http://goo.gl/bMepiL Android). Then, you're good to go. Note that, there is no application fee, whatsoever! +-How do I send my clothes off for washing? You can drop off your clothes at any of our lockers 24/7 and pick up from the same locker location given 4 days turnaround time. Some items may require longer lead time. See our terms and conditions here Terms and Conditions. +-Do I need to be a member in order to use your service? No, although there are those who prefer to buy our package to enjoy greater savings (Package users) vs those who might want to try first and may prefer to pay later (Pay per use users). After all, WashBox24 is pretty much open to everyone. +-What’s the difference between a package user vs a pay per use user? Package users typically purchase the credit package in advance and any usage is deducted from the paid credits. Pay per use users, on the other hand, does not pay until the cloth is ready for pick up. Note that the average price per piece is typically lower if you become a package user, plus more discounts and exclusive privileges. See our package detail here. Shop. +-How does a package user pay for the service? Upon signup, you may choose to buy the credit package. Once you have selected the package you want, you will be directed to our payment gateway partner’s page where you will have different options to pay including credit card. The purchased credit will then be transferred to your account automatically upon successful payment completion. +-How does a pay per use user pay for the service? Pay per use user typically drops off clothes without paying in advance. Thus, when the clothes are ready and our system notifies you via SMS, email and/or app, the said SMS, email and/or app will contain payment instruction for you to refill credit through our payment gateway. Once paid, the system will send you a Quick Pin via SMS, email and/or app so you may key in the Quick Pin at the locker to retrieve back the clothes. Shop. +-Does your locker accept cash, coin, and credit card? Yes, any credit or debit cards bearing [Visa, MasterCard] logos can be used for payment. You can either pay online by logging into our website (www.washbox24.com) or pay via the Box24 app (http://goo.gl/zEqt8t iOS, http://goo.gl/bMepiL Android). +-Ok, I've tried your service as a pay per use user before and I love it! So, how can I convert from a pay per use user to a package user to get a lower service fee per piece? Just sign up online at our website (www.washbox24.com) or download our Box24 app (http://goo.gl/zEqt8t iOS, http://goo.gl/bMepiL Android) and pay for any of the credit packages, and you're good to go! Note again that, there is no application fee, whatsoever! +-What is the purpose of having two different color bags? WashBox24 provides our users with two different color bags to differentiate between laundry orders and dry cleaning orders. If you want us to laundry your clothes, place the items in the black bag. If you want us to dry clean your clothes, place the items in the red bag. When we return your clothes, you’ll find them in the same branded WashBox24 bag. Note that for ironing only, you will need to place them in your own plastic bag e.g. a re-used shopping bag. Salute to you for helping us save the environment by reducing the use of plastic bags! +-It’s my first time, so I don’t have your bags, but I want to drop my clothes off now. What should I do? For first-time user, place your items in any plastic bags (e.g. re-used shopping bags) but be sure to insert a note to specify what kind of wash type you want for each items or bags. For package users, when we return your clothes, you’ll find them in the branded reusable bags. For pay per use users, when we return your clothes, you’ll find them in un-branded plastic bag. Join us as a package user and receive stylish WashBox24 bags, plus greater saving and a chance to make a difference for our planet. We really mean it! +-Should I dry clean or launder my item? +-What if I put the wrong item in the wrong bag (i.e. dry clean in black bag or laundry in red bag, etc.)? Although we try our best to contact our customers to ask for the confirmation of each misplaced order that may be accidental in nature, we reserve the right to change and/or cancel the wash type according to what our garment expert deems as most appropriate for each particular item. This is to prevent possible damage, for example, shrinkage or loss of colors. Often times, we refer to the care label as suggested by the manufacturer. However, in the event of such changes, prices will be charged according to the actual wash type that we deem as final and have actually processed, unless there is an instruction note from you to process the item otherwise. Note that we cannot be liable for any damages arising from such instruction and may reserve the right not to service any items that are not in line with our quality control policy. +-I have special instruction for my order, what should I do? When you are placing an order, you may insert a laundry note in our app or simply drop it in together with your clothes. For package users, there is a plastic pocket on the WashBox24 branded bag itself that you may add notes and special instructions (e.g. fix the button, hand wash, etc). You may provide us with your buttons and we will gladly fix it up for you at $1/button. Don’t have a button? Don’t worry, let us know and we will find the closest colour and size to fix it up at $2/button. Isn’t that nice to be a package user? +-What is the standard turnaround time for dry cleaning and laundry service? In most cases, orders are delivered back within 4 days excluding [Sunday] and public holidays. Note that we do our best to ensure that your orders get delivered back in a timely manner. However, we also need to ensure that we properly treat stains and press your clothes. So, whilst most laundry and dry cleaning may take 4 days, some items may require longer lead time e.g. bag & shoes and certain house items e.g. carpet, curtain, dolls may take up to 7 days or more. +-Will my Box24 credit balance ever expire? Any balance (regardless of value) that is active at least once every 100 days can be carried forward for unlimited period or until credit runs out. Note that, if the balance is less than 4 SGD and has been inactive for 100 consecutive days, the whole remaining balance will expire on day 101. On the other hand, if the balance is 4 SGD or more and has been inactive for 200 consecutive days, the whole remaining balance will expire on day 201. Make sure to sign in and check the expiry date of your credits in "Closet+" section. In addition, a kind reminder that all purchased balances cannot be redeemed for cash. +-Why is my Box24 credit showing a negative balance? That's because you have spent more than your credit balance actually. Because the continuous nature of our operation, we typically don't hold up the order and would continue to process the items as scheduled. However, if you don't have enough credit or haven't paid for the order, the credit balance as reported on the web or the app will show a negative number. You may pay to settle the outstanding dues from various channels e.g. app, web, etc, and the system will issue a Quick Pin upon full payment. +-I see Box24 services in other countries. What do I need to do to use your services if I am in a new country? Our app is designed for using in multi countries. Please press “globe” icon to sign out and select new country and language. You can login by using the same username and password, and fill up your new local mobile number to continue using the app in the new country. +-Can my Box24 credit be used in another country? We regret to tell you that your credit from one country can’t be used in another country as characteristics, prices and costs of each kind of services are different in each country. +-How do I gain access to the locker? Both package and pay per use users, can use your mobile number or request the Quick Pin from the Box24 app (http://goo.gl/zEqt8t iOS, http://goo.gl/bMepiL Android) to access the locker.For a pay per use user, the said mobile number will be used to send payment instruction via SMS by which you can pay the service fee through the Website or Box24 App. Once paid, you will receive a Quick Pin to retrieve back the items. Please note that, for the package user, if the credit balance is negative, and for the pay per use user,if not paid, no Quick Pin will be sent to you, meaning you may not be able to pick up the items. Quick Pin (QP) is a temporary app-generated 12-digit number used as a shortcut to request a service or perform a certain transaction with a specific Box24 locker location. For example, Quick Pin can be requested from the app to drop off clothes, or be sent together with the sms/email/app alert to pick up clothes when they are ready. Note that one Quick Pin number can only perform one action at one location at any one time. So, it is important to request Quick Pin from the Box24 app only when needed. +-How do I drop off clothes at locker using Quick Pin? Simply download the Box24 app (http://goo.gl/zEqt8t iOS, http://goo.gl/bMepiL Android) and request Quick Pin under Locker Quick Pin menu. +-Will a Quick Pin ever expire? Each Quick Pin that is requested by a user via a Box24 app (e.g. Quick Pin to drop clothes at locker) can only be used once and is valid for up to 24 hours. Once the Quick Pin is used at the locker, it will automatically become expired. On the other hand, a Quick Pin that is generated by the system (e.g. Quick Pin sent together with SMS to pick up items) will be valid up to 48 hours, unless the said Quick Pin is used then it will be automatically expired as well. +-What if I don't live/work in the building that has a WashBox24 locker, can I still use your service? +-Do I need to reserve a locker before I go to the locker? No, simply visit our locker and the touchscreen will assign an empty locker for you automatically at random. Please note that the availability of an empty locker is up to the locker utilization at the time. To avoid disappointment, please remember to check locker availability via our app (Menu > Info > Locations). +-How do I know which locker I should put my clothes in? Our touchscreen will assign an empty locker for you automatically at random. Please note that the availability of an empty locker is up to the locker utilization at the time. +-Is there a limit to how many lockers can be claimed by a person in a given day? Yes, the limit is set at 1 locker/user/service type/day. However, in case you forget or want to put additional items in the locker, you may use the same mobile number or Quick Pin to re-open the claimed locker as many times as you would like The only thing to know is our staff unload all clothes everyday at noon, so be sure to make the cut off time if you want the clothes to return per schedule. +-What if there is no available locker? Good question, but we won’t let this happen. We adjust our pick up schedule based on the volume of orders. This is because our locker is connected to the internet and to our central server on a real time basis, so we can pick up as many times a day as we need to in order to ensure locker availability for all customers. In addition, you may look up the number of available doors at each locker location from our Box24 app, which gives a real time update on the locker availability so you can plan when to drop the clothes off better. Note that this app feature is not for locker booking. Because locker activities are dynamic, we reserve the right to treat incoming orders on a first come first serve basis. +-Is there a minimum order if I am to drop the clothes at the locker? +-How am I alerted when my clothes are ready in the locker? We will send you an sms/email/app alert as soon as the items are ready for pick up. You may adjust the notification setting in the app under Setting menu (http://goo.gl/zEqt8t iOS, http://goo.gl/bMepiL Android). +-When pick-up, will my clothes be in the same locker number I dropped them off? No, your clothes will most likely be returned to a different locker number but within the same location. You only need to input the Quick Pin at the touch screen. The touch screen will display the locker number that has your clothes in it automatically. +-When pick-up, can I request to pick up from different location (i.e. drop off at location A, but want to pick up from location B)? No, our current operation is to return the clothes back to the original location. We are working on that though, and will surely let you know when we can offer that service. +-How much time do I have to pick up the clothes after it has arrived at the locker and what happens after that? You have up to 48 hours to pick up the clothes upon receiving a notification to pick up. The notification is sent to you only after the clothes have actually arrived at the locker. After 48 hours, you will receive a reminder for pick up and, and if the items are still not removed, another notification will be sent once we have actually removed the items to our warehouse. Note that you may contact our hotline if you have any special request but please understand that we reserve the right to adhere to our term and condition and that not every request may be fulfilled. +-Do I need to use any password to retrieve my clothes? No, just make sure you input the Quick Pin that comes with the sms/email/app alert correctly. You pick the items up and off you go! +-How do I place a Bag or Shoes Spa and/or House Items order? You can place the order just like you would place an order for laundry or dry cleaning, meaning you may drop off your items at lockers or call us to arrange for a pick up for large items. +-The price range for Bag & Shoes Spa and House Items is vast - how much will I be charged? Materials of bags, shoes, and house items (e.g. carpet, curtains, etc.) vary, so it’s difficult to provide a comprehensive price list. Our expert attendants will inspect and notify you via the Box24 app under Closet+ menu (http://goo.gl/zEqt8t iOS, http://goo.gl/bMepiL Android), so you see the picture, the price, and processing time. Feel free to send us a picture of the item at cs.sg@box24corp.com and let us know in advance what type of items you need cleaned and we will get back to you with our quotation. +-What is the standard turnaround time for Bag & Shoes Spa and House Items? +-How am I alerted when my Bag & Shoes Spa and/or House Items are ready? Closet+ is WashBox24's proprietary online item tracking system that allows our users to track history of serviced items, review pictures of items in pre-processing condition, check outstanding credit balance, and review credit and promotion item expiry dates. To access Closet+, simply log in with your registered email as the username and your ID or passport number as the password (unless it has been changed in "My Account" section). Closet+ is available on website and Box24 app (http://goo.gl/zEqt8t iOS, http://goo.gl/bMepiL Android) so you can enjoy the convenience and the transparency that is exclusive only to WashBox24 customers. 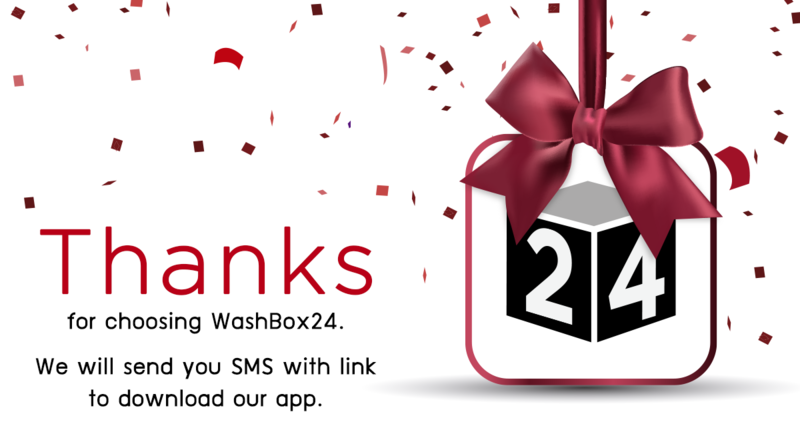 +-How does WashBox24 keep track of my clothes and ensure they are not lost? Upon drop off, you will receive an order confirmation within 10 minutes, by default, from the app push notification and email (You may change this under the Settings menu). We also barcode individual items. The barcodes are inconspicuously adhered to the underside of a care label. Moreover, items are then photographed to ensure they can be tracked throughout the process, typically within 12-24 hours after drop off, subject to drop off time. You may visit the "Closet+" menu to review the numbers and pictures of your items online as well. +-How does WashBox24 know how many items are dropped off at the locker, and how do I check if WashBox24 actually picks up the right things? As soon as we pick up your items, we would take pictures and adhere tags to your items to make sure that they can be tracked throughout our process. You may visit the "Closet+" section to review the numbers and pictures of your items online. In case that they are not correct, please contact cs.sg@box24corp.com or call our Hotline at 96556366 to prevent any damage or loss that might happen. Please note that if such contact is not made within 48 hours since you drop off the items, we kindly ask for your understanding that we reserve the right to deem such numbers and condition of items as shown in "Closet+" as final and that we shall deem that you confirm such numbers and condition of items as the final pre-processing condition. +-Are there surveillance cameras (CCTV) at the locker? Yes, this is for security reasons for our customers and staff. Most of our lockers are located at the lobby or car park entrance premise, which is normally under CCTV surveillance, so you can use our lockers safely. +-How do I get WashBox24 in my building? Glad you ask! Fill out this short form . Your life is about to get a whole lot easier! +-How do I work for WashBox24? We are always on the hunt for smart and talented people. Check out our career page here About US. +-How do I get in contact with WashBox24? Email us at cs.sg@box24corp.com or give us a call at 96556366 during 9.00 AM – 9.00 PM. +-What happens in the event my clothes are damaged or lost? Contact cs.sg@box24corp.com or 96556366 immediately within 24 hours after the original pick-up/return delivery date and time and we will deal with this situation on an individual basis. See our terms and conditions here (http://goo.gl/zEqt8t iOS, http://goo.gl/bMepiL Android). +-Where can I view your term and condition? By using our service, you automatically agree to our terms and conditions. You can view our complete terms and conditions by clicking here Terms and Conditions.